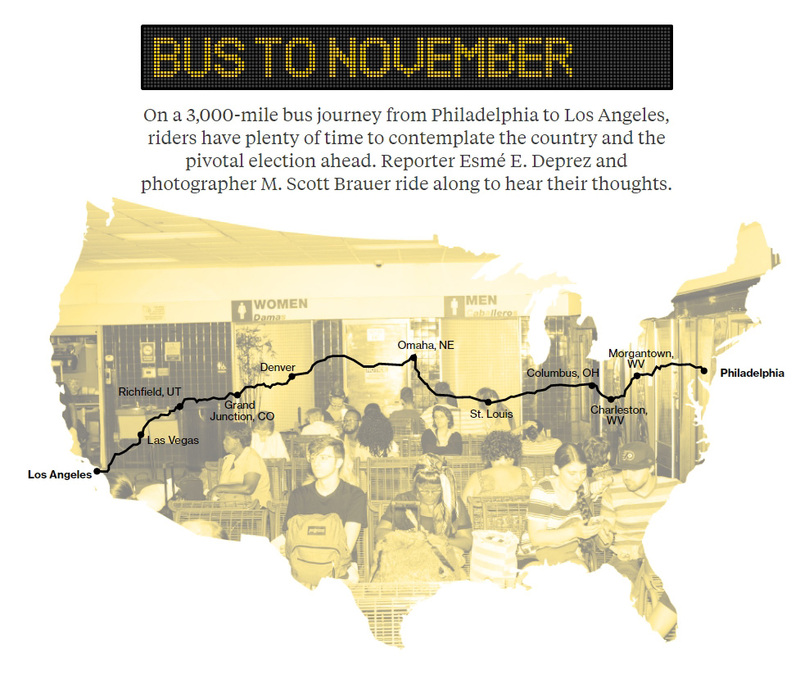 From Aug. 1 to 14, 2016, I traveled with Bloomberg reporter Esmé E. Deprez, I traveled by Greyhound bus from Philadelphia to Los Angeles, speaking to people we met along the way about their lives and the upcoming election. The final dispatch posted on Friday, and you can scroll down for the rest of our work over the trip. You can also see me in a short video by Griffin Hammon that aired on Bloomberg/MSNBC's With All Due Respect on Aug. 12, 2016 (starting at about 39:30; also available on youtube and embedded below). I've never done anything quite like this, so it was a bit of an experiment. I'm particularly proud of the work I did and also that it accompanies such excellent reporting by Esmé. The work will hopefully serve as an addition to the work I've been doing on the 2016 election, broadening it's scope to look at voters across the country. For more photos, especially take a look at our post from Denver featuring short interviews and portraits I did with voters in Lexington, Nebraska, and on the bus from there to Denver, or the post from Las Vegas.